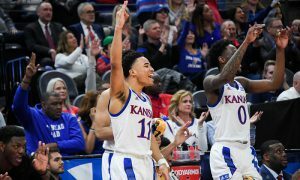 Here is everything you need to know about the Big 12 game between Kansas State (2-3, 0-2 in Big 12) and Baylor (3-2, 1-1). QB Skylar Thompson. It’s time for K-State to face facts. Any flirtation with Alex Delton is a foolish errand at this point. If the Wildcats want to save their season and earn a bowl berth, then Thompson needs to be their quarterback. He came off the bench to lead the Wildcats back into their game with Texas, as the Wildcats were down 19-0 to start the second half and he helped shave the lead to 19-14. The offense responded to Thompson at the controls and there should be no question as to who should start moving forward. RB Alex Barnes. This guy just flat needs the ball more. He’s rushed for only 277 yards in five games, but that’s more than four yards per carry. He is K-State’s most complete back, and he’s rolled the passing game into his repertoire as well. When K-State moved the ball well against Texas, Barnes was in the middle of it. He could use more work. LB Da’Quan Patton. 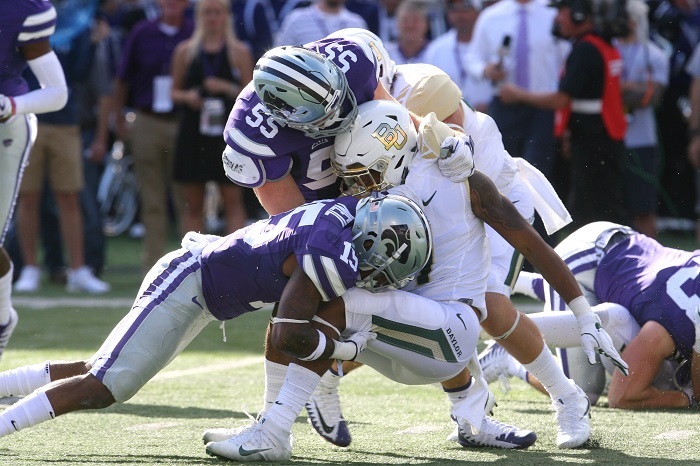 I was at the K-State-Texas game in person and I was impressed with what I saw out of Patton, an under-publicized defender in the Big 12 who showed me athleticism and physicality at the football against the Longhorns. He was in the middle of many of the Wildcats’ big defensive play last Saturday. He has just 30 tackles so far this season, but I suspect we’ll see more production as the season progresses. In fact, he’s had 17 of his tackles in the last two games. DB Duke Shelley. He is probably K-State’s best all-around pass defender in the secondary and he adds juice in the kick return game. He’s a confident tackler and a solid pass defender, with 35 passes defended and five interceptions in his K-State career. He’ll be around the ball all afternoon against Baylor. QB Charlie Brewer. Before the season our Pete Mundo wrote that Charlie Brewer could end up as the second-most productive passer in the Big 12. Well, through five games Brewer has thrown for 862 yards, 6 touchdowns and 1 interception (and he didn’t get all the snaps in Baylor’s non-league games either). It’s clear that Brewer grew the way that head coach Matt Rhule hoped he would this offseason and has firmly dug himself in as the starter. WR Jalen Hurd. The Tennessee castoff proved worth the wait as a transfer. He leads the Bears with 31 receptions for 415 yards and 3 touchdowns. He’s quickly become Brewer’s favorite target, despite the presence of holdover pass-catchers like Denzel Mims, JaMycal Hasty and Chris Platt. DLs James Lynch and Greg Roberts. There were concerns about whether the Bears could generate a pass rush this season. Lynch and Roberts have answered the call, as the pair have three sacks each along with a combined nine tackles for loss. In fact, the pair each has two pass breakups, too. They’re just two of the reasons Baylor’s defense has improved from 2017. LB Terrel Bernard. He’s just 210 pounds, but the redshirt freshman linebacker is playing like a vet, leading the Bears with 27 tackles, 13 of which are solo. He’s also picked off a pass and has 2.5 tackles for loss. Bernard’s start is growing in Waco. 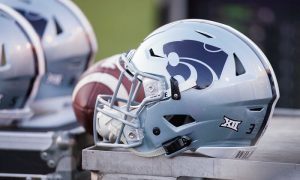 Kansas State is in rare company in college football as the Wildcats rank in the top 20 in wins among FBS programs over the last 23 seasons. K-State is one of only four teams in the Big 12 to reach 100 league wins since the league’s inception in 1996. The Wildcats also rank third in the conference in winning percentage since round-robin play began in 2011. They sit at .631 (41-24), trailing only Oklahoma (.815; 53-12) and Oklahoma State (.692; 45-20). Baylor has won four of the last five meetings in Waco, including four consecutive visits from 2006-14. Baylor ranks 14th among Power 5 schools in total offense (488.0 ypg) and 8th among P5 in passing (331.4 ypg). The Wildcats lead the all-time series 9-6 dating back to 1969. The series is tied 4-4 in Waco and the two programs have split two meetings at McLane Stadium in 2014 and 2016. The Wildcats’ season is teetering and things are getting weird in Manhattan. Going into the Texas game the word was that head coach Bill Snyder wanted Alex Delton has his starting quarterback and the rest of the staff wanted Skylar Thompson. Well, Delton started against Texas and the offense was stuck in neutral. Thompson came in off the bench in the second half and rescued the Wildcats in a losing effort. Questions about the quarterback situation led to a testy exchange between Snyder and the Manhattan media on Tuesday, but it sounds like Thompson will start (but Snyder wants to play both quarterbacks). Snyder also said on Tuesday, “you write what the hell you want to write,” per the Wichita Eagle. Well, in that case coach, the quarterback situation is weighing the Wildcats down to the point where serious question are being asked about bowl eligibility and, perhaps, Snyder’s tenure in Manhattan. The longer this drags on, the louder the questions will get. The Bears aren’t what they were under Art Briles, but they’re improved and that’s what Matt Rhule was hoping for in his second season in Waco. Charlie Brewer solidifying his grasp on the QB job has been key, as has the emergence of Hurd as a wide receiver. But the Bears have been diverse on offense, which has been hard for defenders to scheme. The fact that the Bears have already won a Big 12 game is encouraging, too. The defense gave up 63 points to Oklahoma last week, but that’s par for the course right now as the Bears continue to build up depth on defense. But the Bears managed to keep their other four opponents under 30 points. Prediction: Baylor 23, Kansas State 18. Kansas State’s defense held Texas to 19 points. But that K-State offense was on life support last week. When Skylar Thompson is on the field, it should respond. But I have no idea what to expect when Alex Delton is on the field. Baylor’s offense is actually superior to Texas’, in terms of spreading the field and taking full advantage of all its weapons, but not necessarily talent. Still, Charlie Brewer’s fine play, combined with Baylor’s growing confidence on defense, should win the day for the Bears.